The floating ring seal is often used in an oxidizer and a fuel pump of the turbo pump unit in the liquid rocket engine because the floating ring seal has the ability to minimize clearance without rubbing phenomenon. For the analysis of performance and vibration characteristics of the turbo pump unit with floating ring seals, the exact prediction of the lock-up position of the floating ring is essential to evaluate the leakage and rotordynamic coefficients from the floating ring seal. The governing equations, whichare based on the ‘bulk-flow model’, are derived from extending the eccentric annular plain seal analysis. The solution procedure is developed by using the Fast Fourier Transform Method of Nelson and Nguyen. 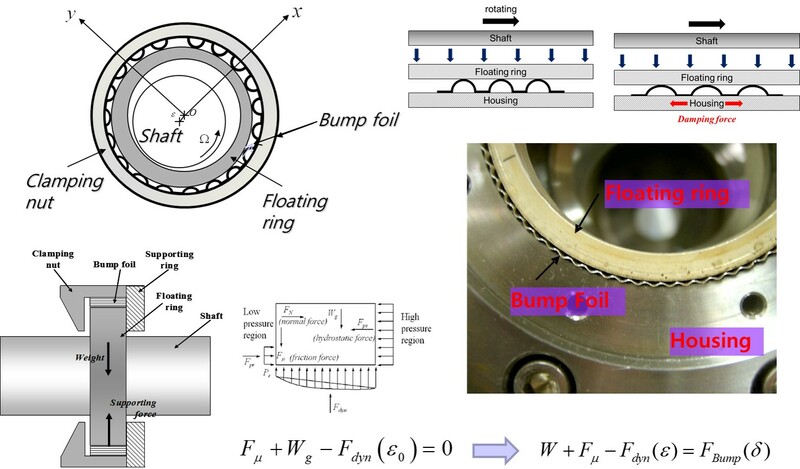 The results of lock-up position, attitude angleof the floating ring, leakage flow rate, and rotordynamic coefficients are presented with operating conditions and geometric parameters of the floating ring seal for an example case. The bulk-flow model was used to calculate the static and the dynamic characteristics of floating ring seals because the solutions based on the numerical integration of the complete Navier?Stokes equations can be very time consuming. A steepest-descent method is used to find the seal's equilibrium position efficiently. The bulk-flow model is governed by three partial differential equations on eccentric working conditions. A finite-difference scheme has been used to solve the nonlinear governing equations. Compared to Nelson and Nguyen's fast fourier transform method, this scheme has better consiste ncy. Perturbation analysis of the flow variables yields a set of zeroth and first-order equations. The SIMPLE algorithm is used to integrate the system of bulk-flow equations. Comparisons of the numerical predictions (lock-up eccentricity ratio, leakage flow rate and rotordynamic coefficients) with Ha's results, which were formulated using the Fourier series, and experimental data are presented subsequently.